First up, apologies for our website going down about three weeks ago. Our hosting company in the USA told me, that some plug-in used on the site, malfunctioned. This could only be fixed by paying a developer on their side AUD 112 to trouble shoot and sort it. Evidently, I need to update plug-ins when alerted to do so. After that came the news that we had a random malware attack on the site, which cost another AUD 584 to clean up and be given a clean bill of health for the site – let’s hope all goes well for the next couple of years! Over the past three months I have spent a lot of time alone in the cockpit while making passages, as Annie spends all her spare hours down below, doing an intensive course in French, to brush up on her school French of many years ago. I would occasionally invite her up on deck to do sail changes or to look at once in a lifetime scenery. 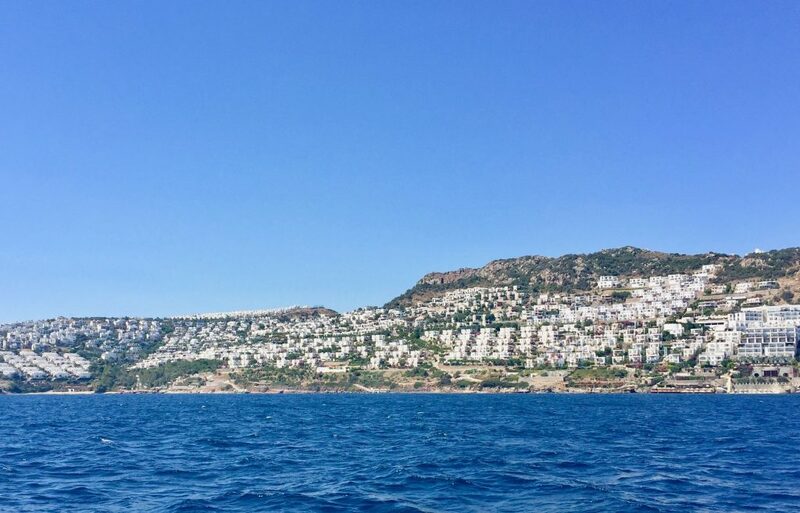 There was no need to call her up much, as we left Gumusluk to sail east around the Bodrum peninsula – the reason, as mentioned in our previous post, the “Concrete coast” stretching on for miles. 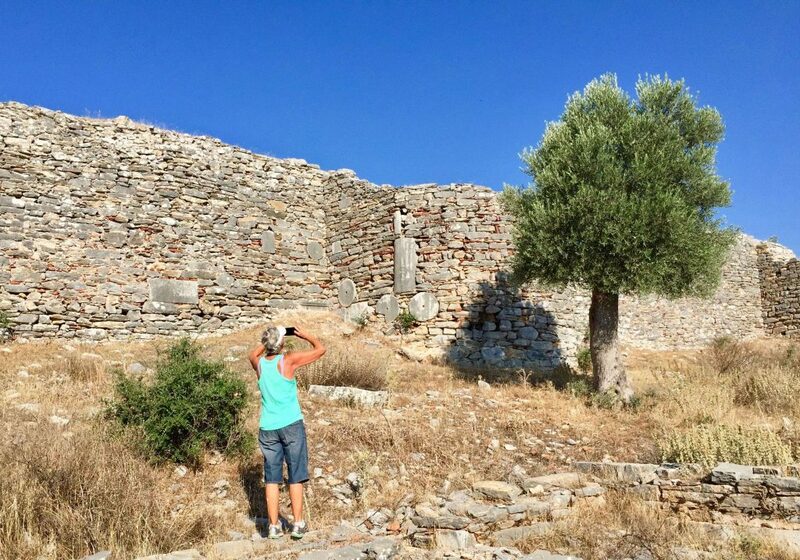 Entrance to Iassus – the Byzantine tower with the fort on the hill above. Still, there is a blessing in these developments being limited to about 4-storeys, fragmented into smaller blocks and painted uniformly white. 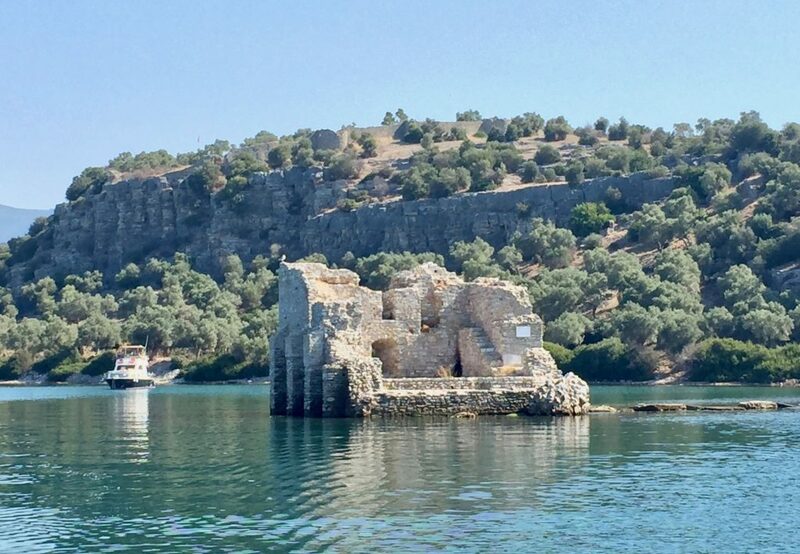 It did get a bit boring though, so we took a shortcut across the Gulf of Korfezi, to anchor in the ancient harbour of Iassus, which is entered though a narrow passage between the ruins of a Byzantine tower and a sunken breakwater. We were welcomed by two German yachts who invited us over for drinks. 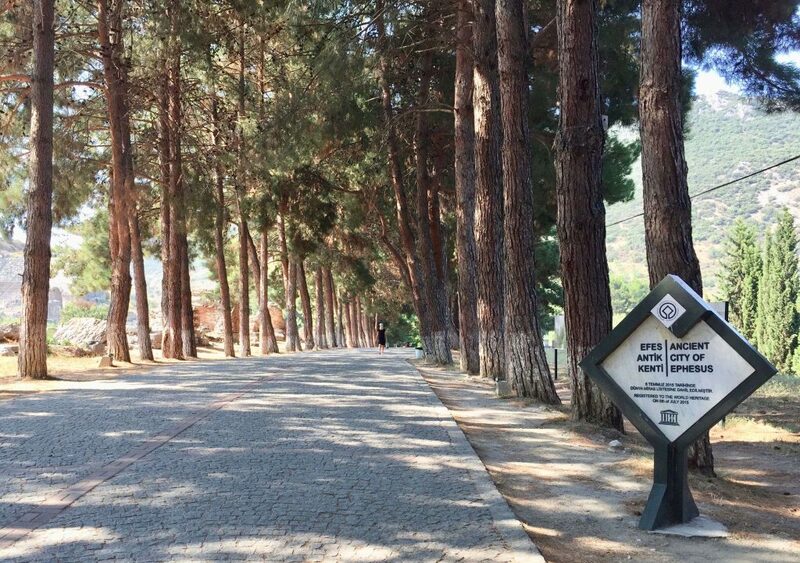 They had sailed from Germany via the Black Sea to visit this site, their furthest point south. The harbour entrance tower from the hill. 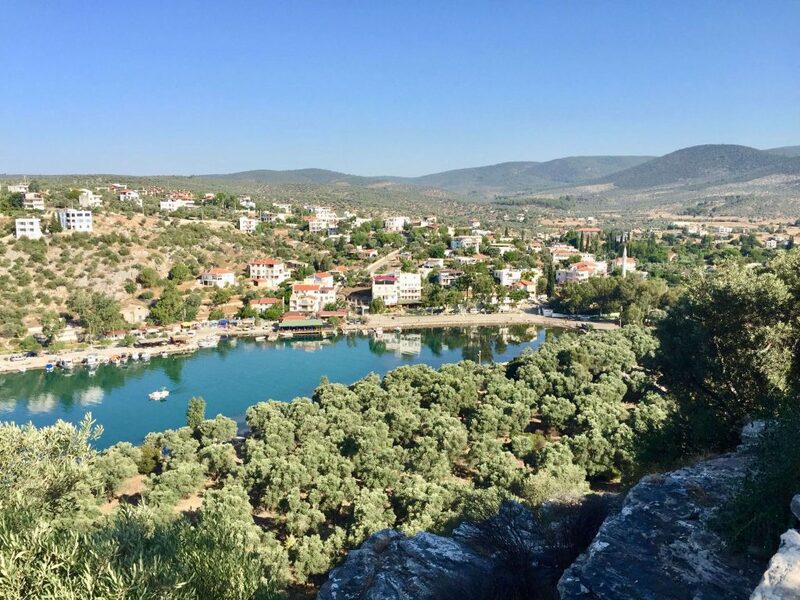 Iassus was colonised from about 900BC around this harbour and has remains of the Agora, theatre and houses on the hill on the eastern side. 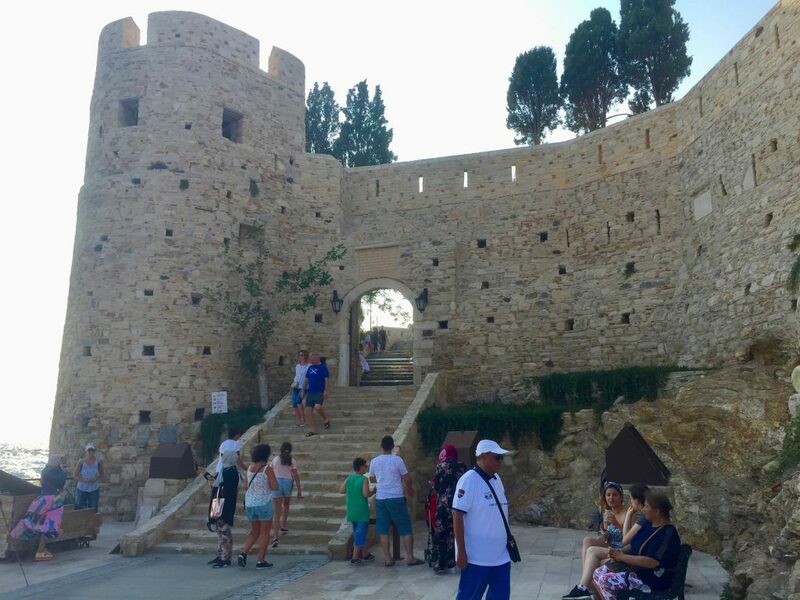 The substantial fort on top of the hill was built by the Knights of St John, during the Crusades. 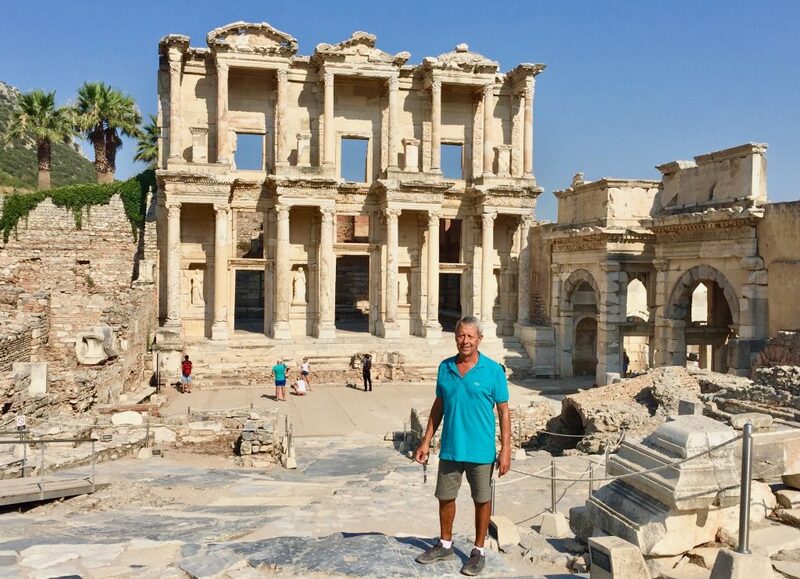 We were able to explore this magnificent site the next morning, the only people about, marvelling at intricate floor mosaics, more than 2,000 years old and still in good condition – we wondered which type of tile adhesive they used! 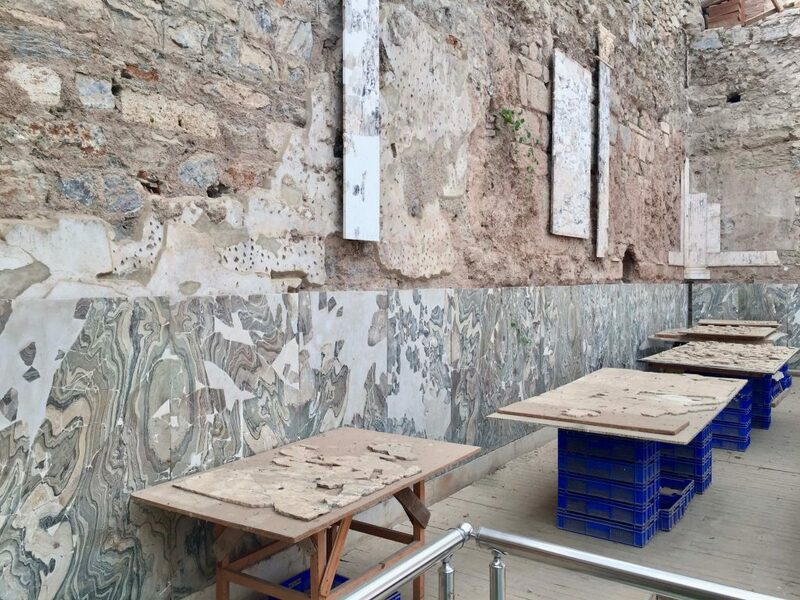 Some of the wall murals still intact. The site is enchanting. The fort built by the knights – note the recycling of materials. View down to Iassus village and anchorage. 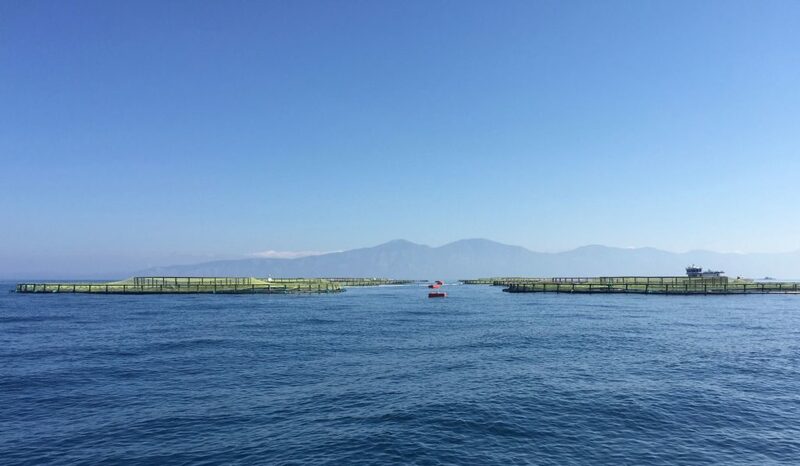 From here we motored through numerous marine (fish) farms, directly to Altinkum on the north side of the gulf, to get into the lee of the land and out of the Meltemi. 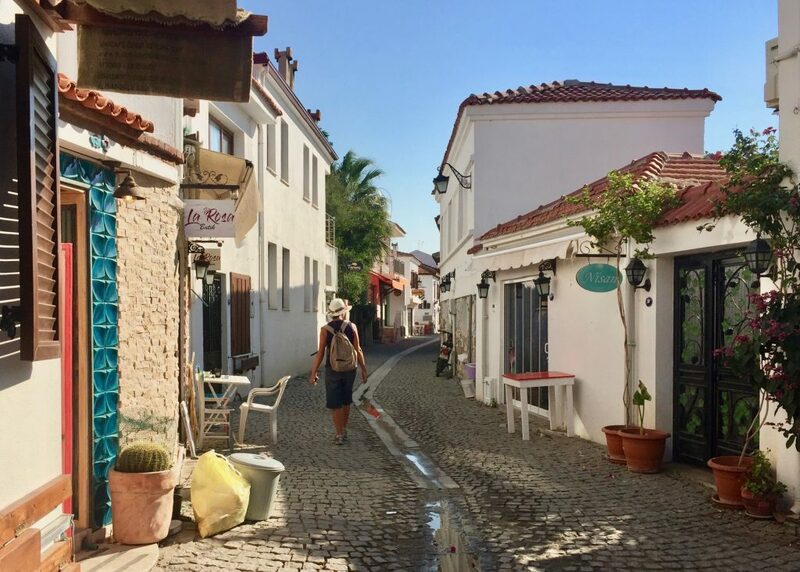 This proved to be a bad choice, as the locals had decided to challenge Bodrum for supremacy in the doof-doof music stakes – until 4 o’clock in the morning. The mosquitos in town couldn’t handle the noise and decided to fly out to sea and seek refuge on Esprit! Bleary eyed, we left Altinkum after an early walk ashore, to tie up at the Didim marina, a mile to the west. 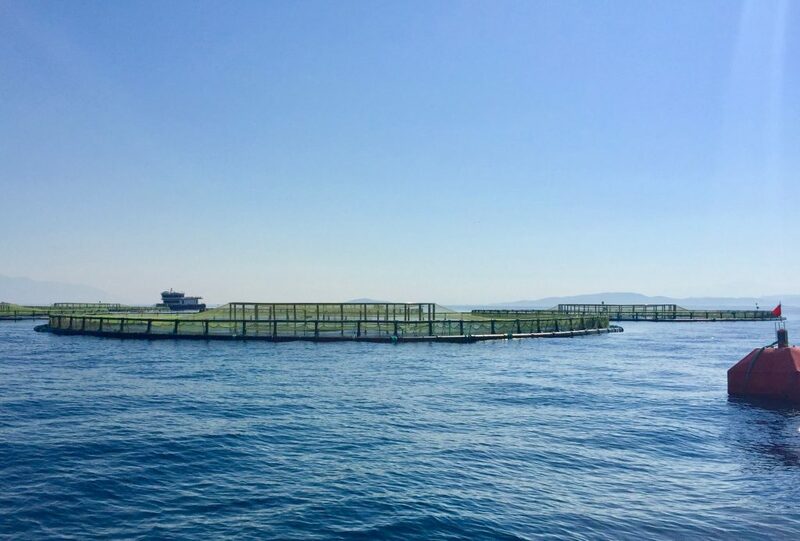 We had to make this stop as the Turkish “Mavi” or blue card requires us to have our two black water holding tanks pumped out and logged, once a month – or face a huge fine. Good on them for their effort at minimising waste pump outs in their beautiful anchorages. We can only hope the day tripper boats and gulets with their hundreds of punters on board, does the right thing. We also filled up with water and diesel. An early night in a secluded bay at Cukurcuk with one other yacht followed – with no music or mozzies. Going north from here to the narrow strait between Turkey and the Greek island of Samos, there are dozens of fish farms to navigate, until you reach the small anchorage of St Nikolas, 21 miles to the north. This little anchorage presented us with the worst challenge in anchoring since we left Sydney. After 11 attempts, the anchor eventually bit in a sandy patch between the luxurious seaweed on the bottom. All of this accompanied by loud outdoor voices – thankfully, there were no other yachts in the anchorage. Although only midday, this necessitated a few calming Efes beers, as soon as the GPS confirmed we were stationary. 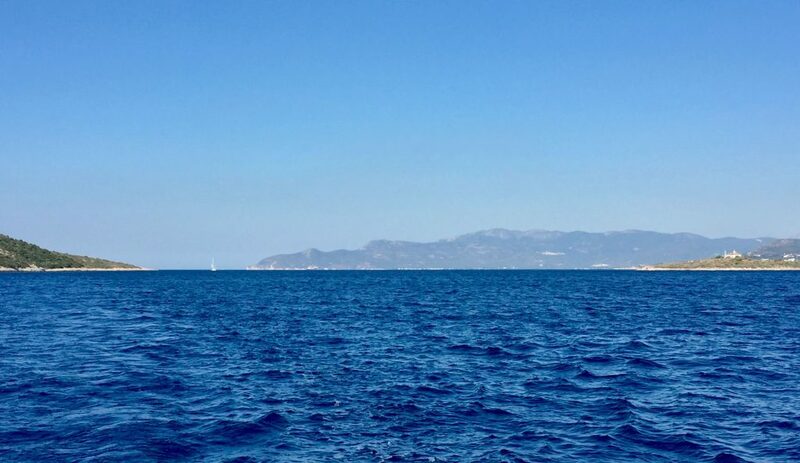 The next morning, we motored through the Samos strait, slightly less than a mile at the narrowest part – the closest Turkey and Greece get to each other. 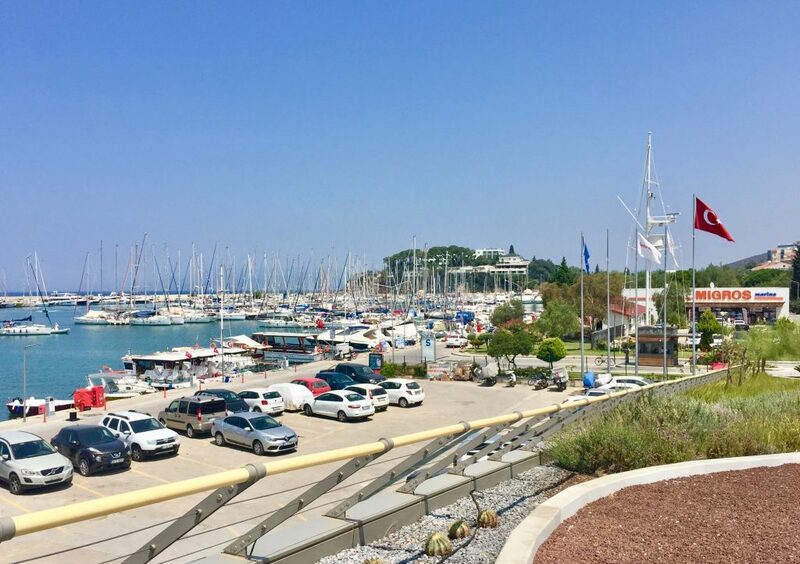 We took the shortest route to Setur marina in Kusadasi harbour, as this west facing bay is in the teeth of the prevailing westerly Meltemi and there are no other anchorages between the strait and Kusadasi. 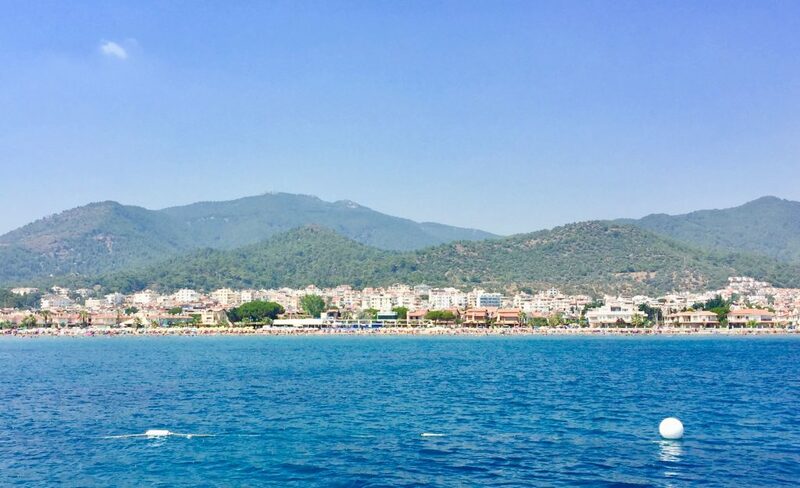 We took the bikes out and cycled through Kusadasi, which is a quaint town, focussed on tourism. The old caravansari and the castle in the harbour were really worth the visit. 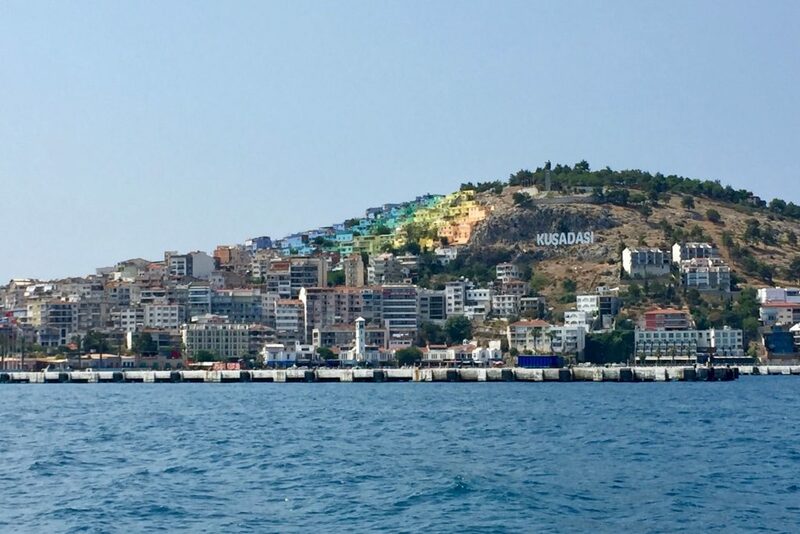 Kusadasi town – colourful housing. 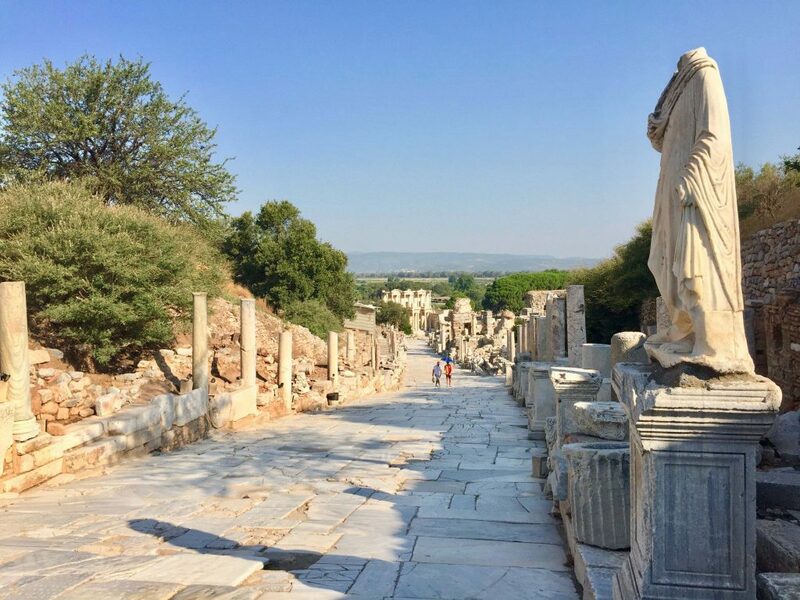 It also gave us the chance to take a taxi early the next morning to Ephesus, about 18km inland. 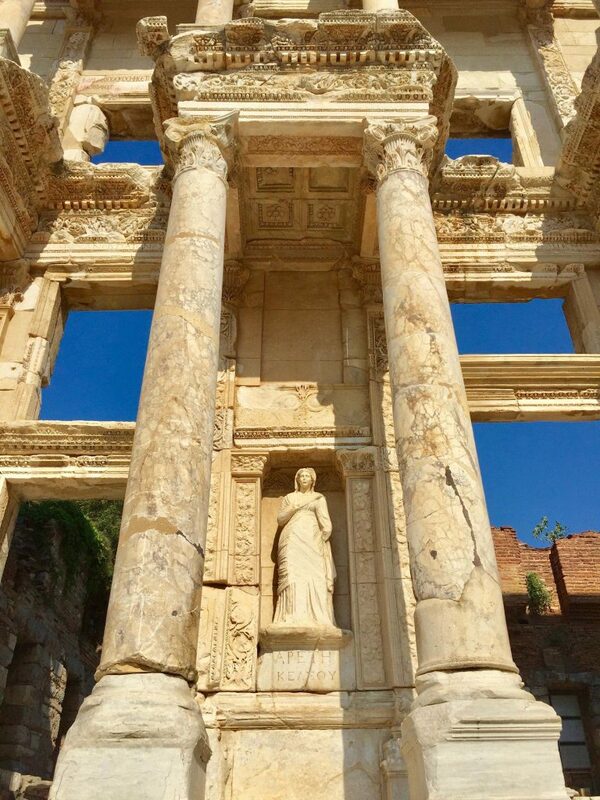 Ephesus is home to some of the most impressive ruins in Turkey. 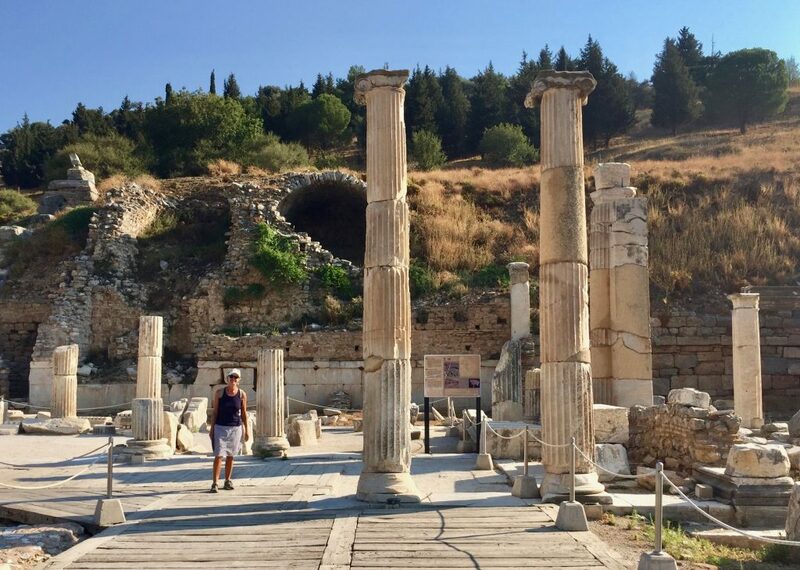 Originally occupied by the Lydians, until the Ionians arrived in 1,000BC. 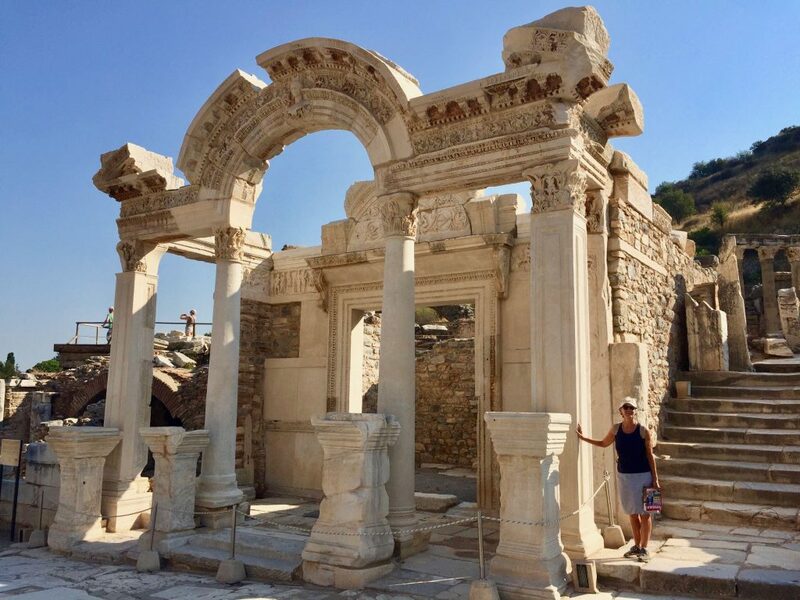 Ephesus survived Alexander the Great’s conquest and later as the Roman capital of the province of Asia, entered its greatest period of prosperity. 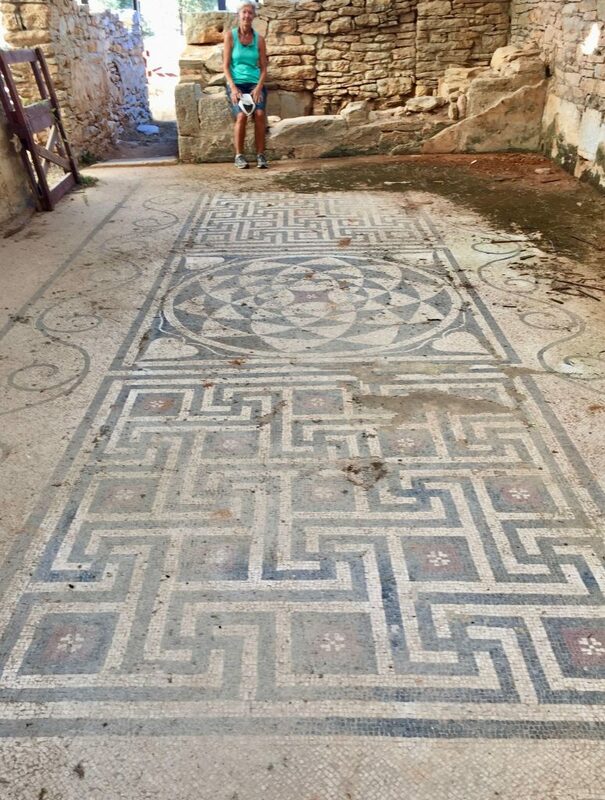 It was sacked and destroyed by the Goths in AD 263. 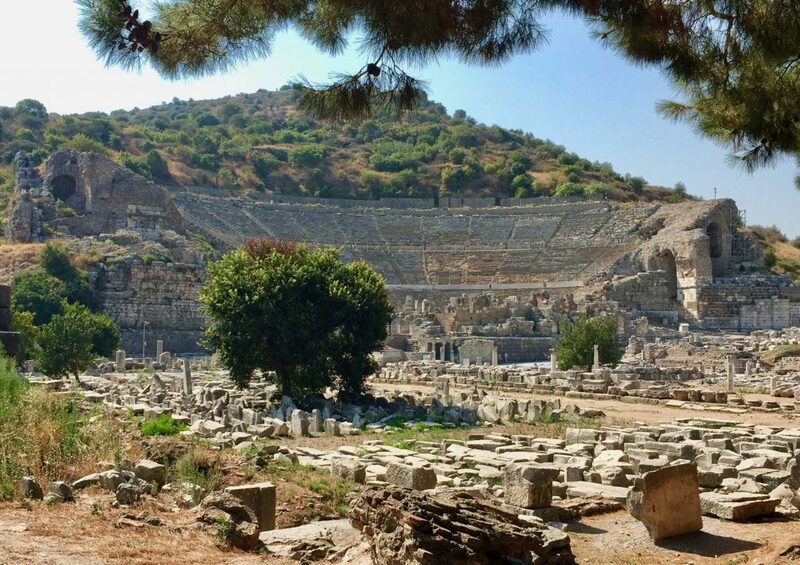 The site today is impressive – you can walk down the marble streets and see the ruins of the theatre, agora, library, odeon, stadium, gymnasium and even the brothel, the bones of the ancient city laid bare. It takes little to visualise what life was like here. After a two-hour walkabout, the taxi took us back to town. 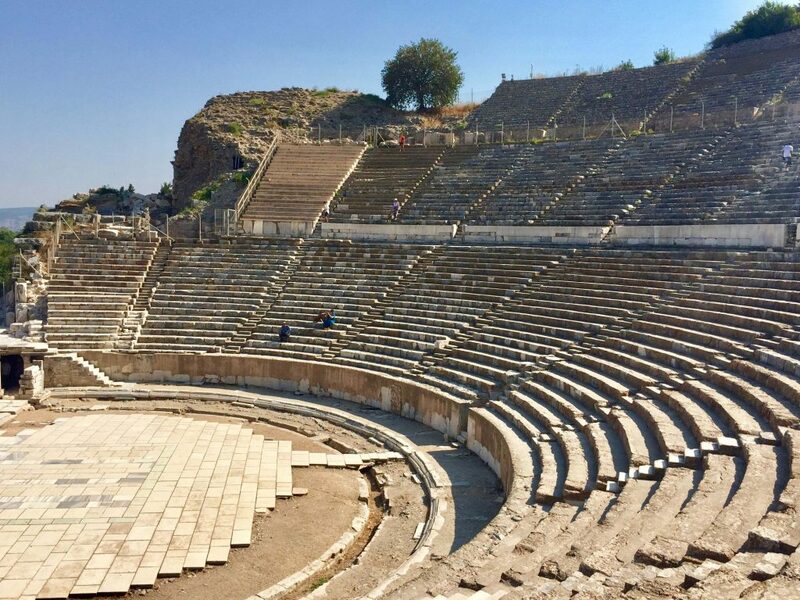 The Great theatre could seat nearly 24,000 people. 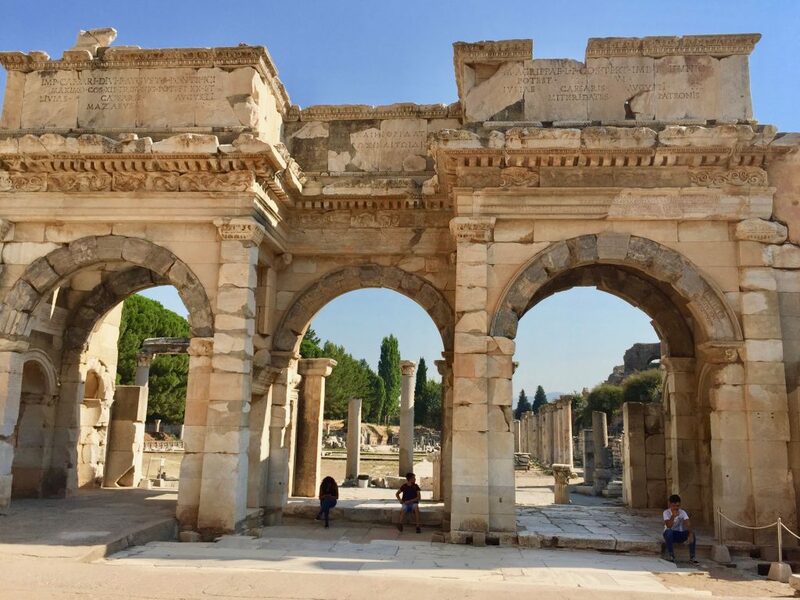 Gate of Mazeus to the Agora. Vicinity of the State Altar. Inside the hillside houses – marble wall cladding. 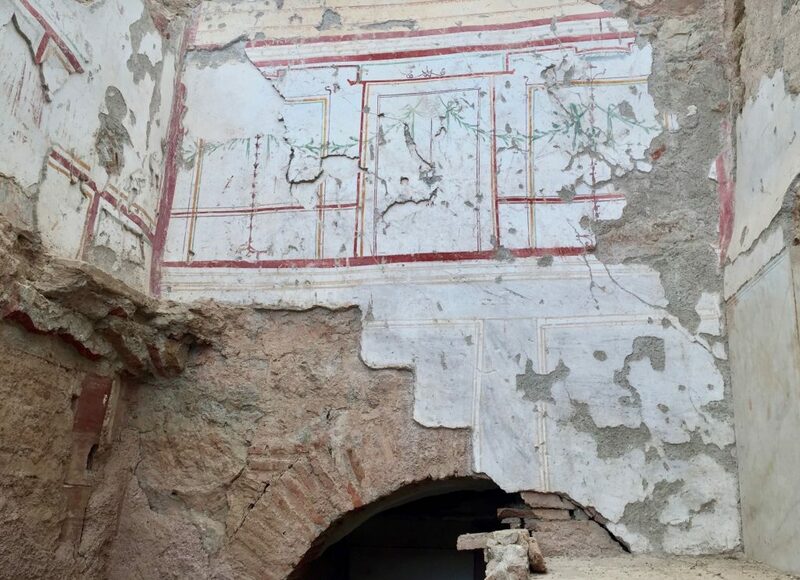 Frescoes on the higher walls. Seeing that it was still mid-morning, Annie decided decided on some retail therapy. She noticed that ladies clothing and swimsuits were very well priced compared to Sydney. Turkish ladies also have fuller figures and therefore she could buy bikinis for gals, with more than a handful. 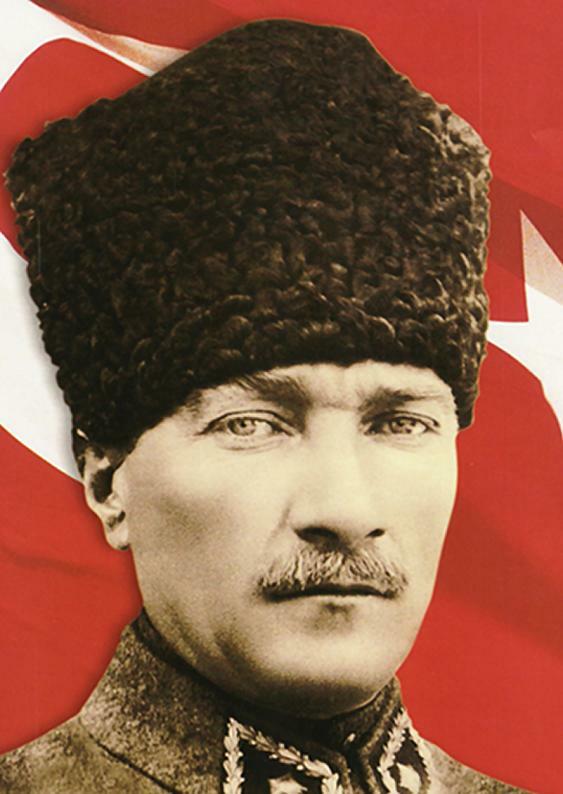 I managed to buy a 665 page English biography on Mustafa Kemal Ataturk, the much revered father of the modern Turkish Republic. Afterwards, we set sail for Cam Limani and had a robust 14-mile sail in a building north easterly, to anchor in a small bay. One of the new bikinis. The good sailing continued the next morning until we rounded the Doganbey Cape to set course for Teos Limani, when a 25 knot northerly hit us. After tucking in two reefs in the main and furling the jib to 50%, we were still overpowered. 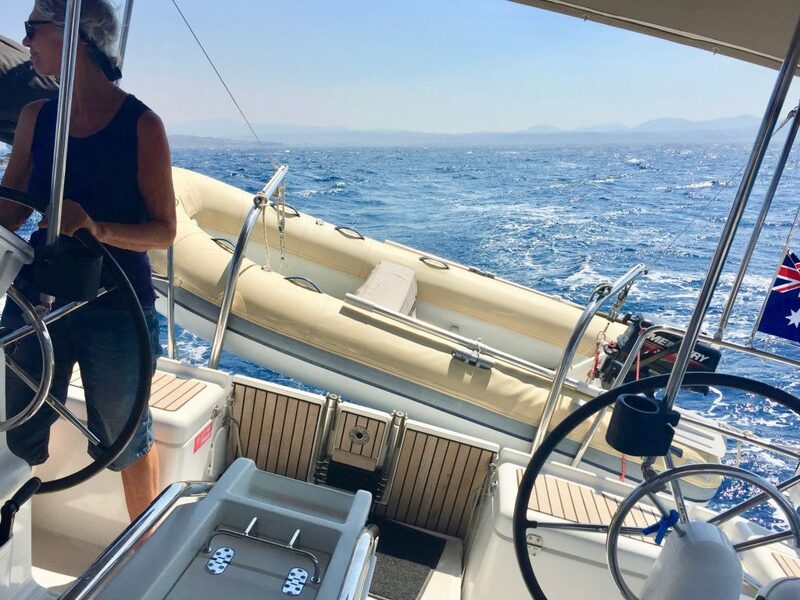 With only the reefed main, we managed to motor sail into an increasing swell to reach Teos anchorage at around midday. The anchor bit well the third time in sandy patch and we enjoyed lunch and a beer watching the board sailors screaming past us in the pumping northerly. Fun, fun, fun – longing back to those days at Big Bay in the 80’s. 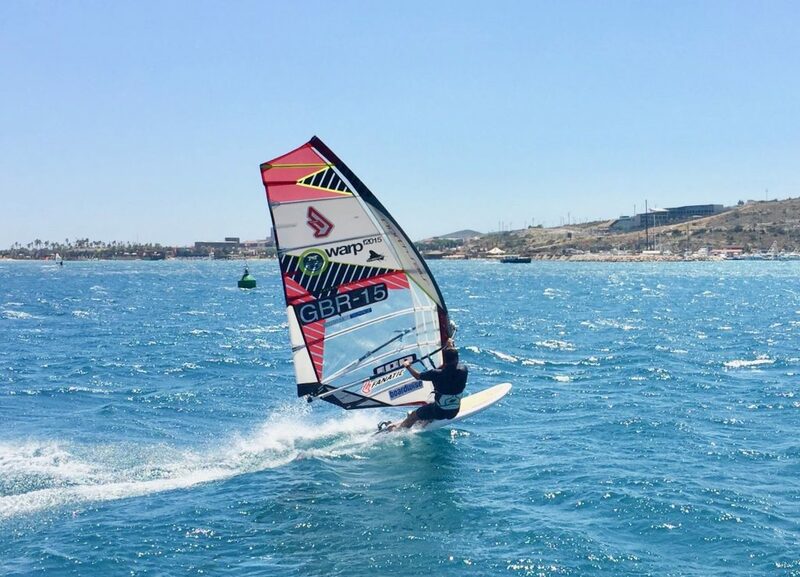 The plan was to sail around the Teos peninsula to Sigacik to visit the old walled town, but the wind was still gusting 25 knots the following morning. 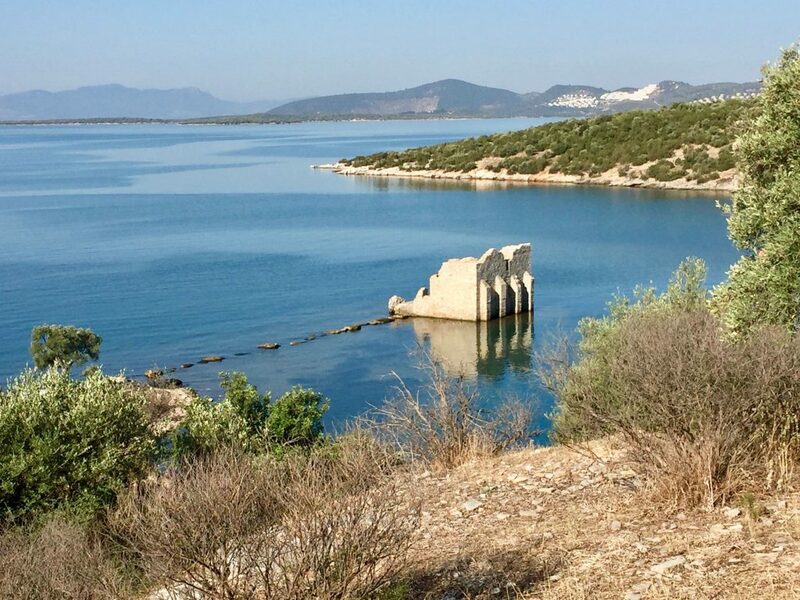 We were confident that the anchor had bitten well in the sandy patch amongst the seagrass, so we went ashore and walked across the peninsula through the remains of ancient Teos. It was a pleasant 3km walk through ancient olive trees and citrus orchards, and it took 40 minutes to reach Sigacik. After walking through the walled town, we had brunch and coffee at a bakery, before walking back along the 3km dirt road. The dinghy and boat were still there. We slept well that night. 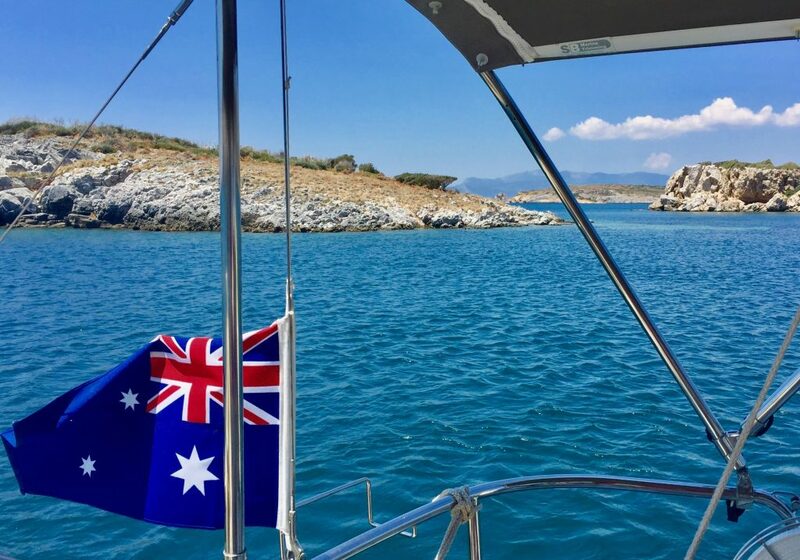 The weather forecast indicated two more days of a strong Meltemi, so we upped anchor and had an exhilarating sail in 25 knots of wind on the beam, with only the jib up to reach the lee shore of Kirkdilim bay. Beautiful clear water with not a soul in sight – but unfortunately a swarm of bees came to visit us at sunset. Annie tried some earlier advice and burned ground coffee, which, together with my frantic swatting, drove them away. 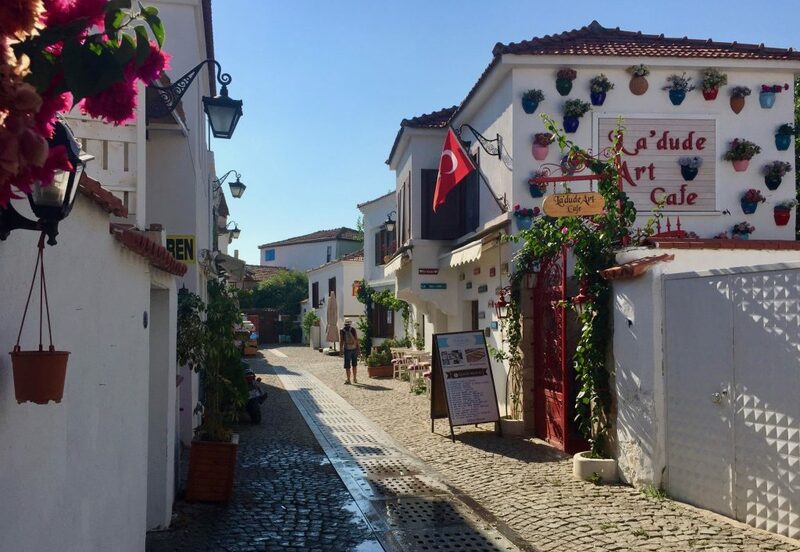 The following day’s sail to Port Alacati was a replay of the previous day, minus the bees. 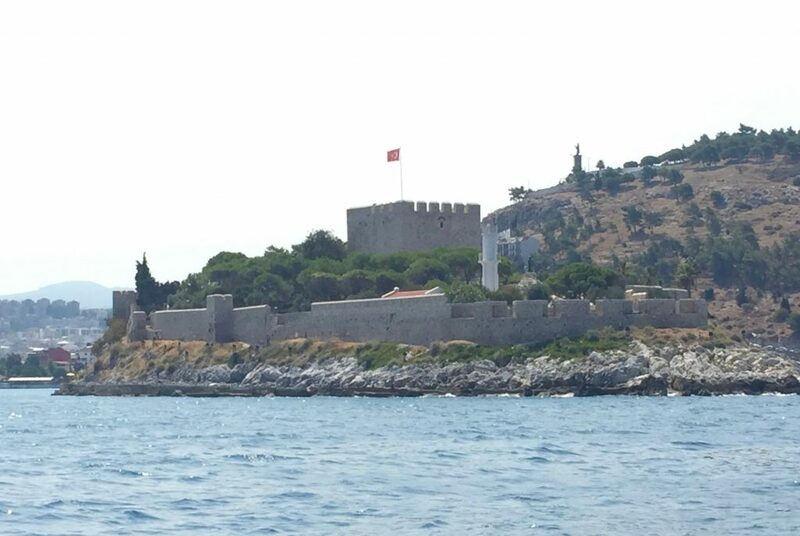 We sailed out of the Ionian coast area when we passed Cesme the next day to enter the Aeolian coast. 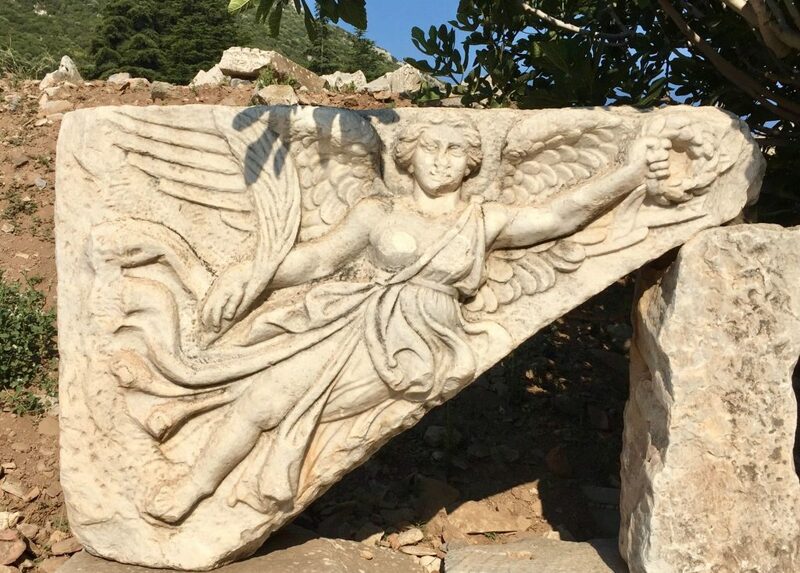 We will report on the Aeolian coast in our next post. Cheers for now!